A disappointing result for the faithful at the Mennaye on Sunday afternoon as the Cornish Pirates slipped to their first defeat of the RFU Championship campaign going down 34-24 to old foes Bedford Blues. No doubt Bedford will be happy to have earned a small measure of revenge for their semi-final defeat at the hands of the Pirates last spring. For the Pirates’ management concerns in the backline with fly-half Ceiron Thomas going off injured with barely ten minutes on the clock and defensive frailties in the mid-field. If the backline is cause for concern then the pack gave a solid display with lock Ian Nimmo having another big game especially in the lineout. Great to see No. 8 Blair Cowangetting back to near his best. Skipper Gavin Cattle as always inspirational and a constant catalyst for all things good from the Pirates. Rob Cook opened the scoring with a penalty,he added a second just before half-time, but that was all the home side were to get during a difficult first period. It was Cattle’s opposite number Stef Liebenberg, the former Cambridge srum-half, who caused the Pirates problems. His quick thinking on the half hour mark led to the Blues first try. Then centre Josh Bassett won the race into the scorboard corner, following a kick ahead from centre Tom Bedford for the Blues second try. Fly-half Jamie Lennard landed both conversions as well as a couple of penalties to leave the visitors 20-6 up at half-time. After half-time Cook chipped away at the Blues lead with a couple of penalties, but the visitors scored a telling blow when replacement No. 8 Don Barrell picked up and crashed over for the Blues third try, Lennard’s extras putting the visitors 27-12 up. Cowan finally got a try for the Pirates and Cook’s conversion cut the deficit to just eight points. However just five minutes later the Blues had secured the try-scoring bonus point as centre Duncan Taylor was put away by replacement lock Mike Howard. Lennard making it four from four conversions. With time fast running out and little more than pride left to play for winger Wes Davies grabbed a second try for the Pirates, but it was all too little too late and the Pirates had nothing to show for the first time this season. 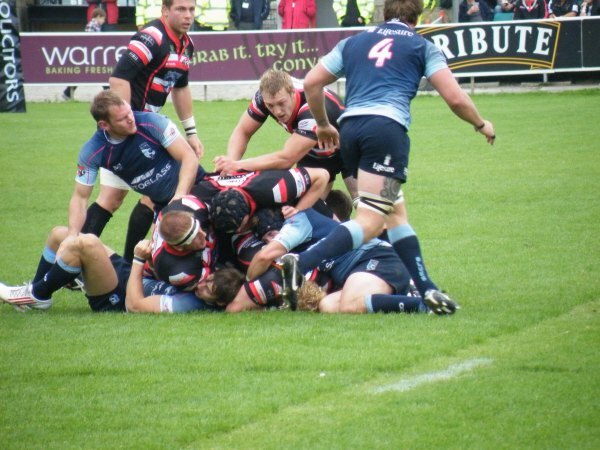 So elsewhere, you can read my report below on the Redruth game in National League 2 South. Now what about the poor old Cornish All Blacks! Yet another defeat this time up at Southend 29-20. Two yellow cards for Josh Lord and skipper Tom Rawlings can’t have helped and the first half scoreboard reflected that at 19-3 to the home side. Despite Kieron Lewitt kicking a second penalty, Southend scored a third try putting them 26-6 up. Launceston to their credit made a game of it when Jamie Salter scored a good try and Lewitt adding the extras. Southend, though kicked another penalty, before Josh Lord back grabbed a second try for the All Blacks with Lewitt again adding the extras. A playing record of played seven and lost six will make for worrying reading up at Polson. In Tribute South West 1 West. A fine win for Wadebridge Camels who defeated Paignton 33-0. Camels ran in five tries through Jack Scott, Jamie Grubb, Sam Stone and Matt Ballard (2). Grubb added the other points with the boot. Penryn overcame Cullompton at the Memorial Ground 10 – 3 with a couple tries from James Martin and Mike Creedon. Camborne lost on the road at Avonmouth OB’s. Trailing 17-9 at half-time, Grant Thirlby had kept them in it with three penalties, they got to within three points after Richie Kevern had scored an unconverted try. The Old Boys pulled away again and despite a second try scored by James Goldsworthy, Avonmouth ran out 29-19 winners.